Nufurn is a preferred supplier of ‘Caress Fabric’ – Developed in the United States, Caress is the leading fabric in the polyester linen market. 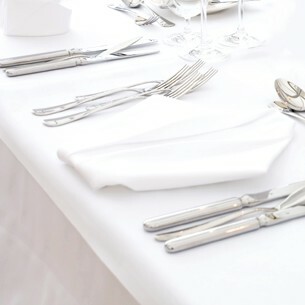 Why do we use Caress Fabric – well quite simply, we believe it is the best commercial table linen available today. Caress feels better and performs better than any other spun polyester product on the market. Caress sets the industry standards for commercial linen. Benefits of Caress Fabric compared to 100% cotton and other spun polyester linens.